Wouldn't it be simple if the answers to life were always yes or no? Unfortunately, they rarely are. People and the lives they lead are complex, messy and complicated. When we try to view the world through yes or no, good or bad lenses, we are often mistaken. When we do this, we often put ourselves in the good category and the others in the bad. This can lead us to judge others harshly while letting our own mistakes slide. The truth is often messier. Yes, we are good, and, yes, because we are human, we are bad. We all have biases and prejudices, and if we attribute them only to others, we can misjudge them. For example, consider the effect of expectation and performance. In 1963, psychology researchers Robert Rosenthal and Kermit Fode ran an experiment to determine if researchers' expectations of rats' performance resulted in performance variation. They arbitrarily labeled the rats "dumb" or "smart" and then had the researchers train them. "The allegedly smart rats did almost twice as well as the dumb rats, even though they were all the same kind of albino lab rat," wrote Liana Simstrom in "Can You Affect Another Person's Behavior With Your Thoughts?" "Their (the researchers') expectations subtly changed the way that the experimenters touched the rats, and then, in turn, the way that the rats behaved," wrote Simstrom in the story, which was produced by Invisibilia, a podcast from NPR. When the experimenters thought that the rats were smart, they felt more warmly toward them and touched them more carefully. "We do know that handling rats and handling them more gently can actually increase the performance of rats," Rosenthal explains. "Subsequent research found that a similar dynamic can happen in people, too," Simstrom continued. "If you have lower expectations of someone, your body language will reflect it: You may stand farther from them, or make less eye contact, for instance," says Carol Dweck, a psychology professor at Stanford. Dweck noted that this is also true of positive expectations. Our beliefs and their influence on outcomes might explain the circular thought process of bias. If you believe that someone is sexist or racist or whatever, will that belief change your behavior and thereby affect their behavior? 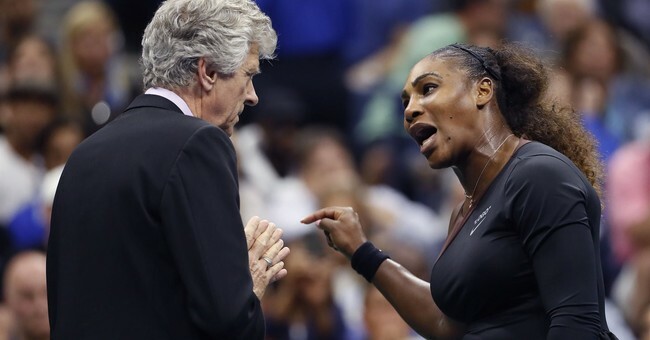 Let's take a recent example: Martina Navratilova recapped the drama of the women's U.S. Open final in her New York Times op-ed titled "What Serena Got Wrong," published Monday. "In the early second set, Ms. Williams was given a warning (for her coach Patrick Mouratoglou signaling her). ... The player is responsible for his or her coach's conduct. And it is actually irrelevant whether the player saw or heard whatever instructions were given; either way, it is still an infraction." Later in the second set, "Williams lost her serve at 3-1 up and demolished her racket -- an automatic code violation. ... Mr. Ramos, effectively, had no choice but to dock her a point. "It was here that Ms. Williams really started to lose the plot. She and Mr. Ramos were, in effect, talking past each other. She was insisting that she doesn't cheat -- completely believable, but besides the point -- while he was making a call over which he, at that point, had little discretion." Navratilova noted that Williams had a history of problems with officials at the U.S. Open. "In 2004, she was subjected to some notoriously awful line-calling and umpiring in a match against Jennifer Capriati. In 2009 ... she (Williams) lost her temper at a line judge, leading to a point penalty that resulted in her automatically losing the match. In 2011, in a final against Samantha Stosur, Ms. Williams lost a point for yelling, 'Come on!.' ... She went on to berate the umpire, calling her 'unattractive inside,' and was hit with another code violation." In the end, Williams attributed the call to sexism, and Ramos stood by his call. Where did Williams get it wrong? According to Navratilova, "we cannot measure ourselves by what we think we should also be able to get away with. In fact, this is the sort of behavior that no one should be engaging in on the court." The reality is that often, yes, we are given the wrong call. Maybe, if we gave people the benefit of the doubt, we might get better calls more often. When we look for right or wrong, we often find it. On which do you want to spend your time?